In our list of concrete furniture ideas, we will be running you through all our favorite designs on the web that use concrete as one of their main materials. We’ve split the following into benches and ideas for tables and chairs. So peruse to your pleasure and prepare to be inspired! If you’ve got a big family or are frequently using your patio for barbeques and parties, it’s likely that you’ll need furniture that maximizes the space and fits as many people as possible. If this is the case, then benches are the way to go. Benches are also perfect for sitting to read a book, or just taking a moment away from a busy life indoors. Whatever your motivation, benches are always a great addition to the patio and we’ve come up with a list of some of the best concrete bench designs. We love how this larger cast concrete bench design seems to sweep across the space in a perfect arc. 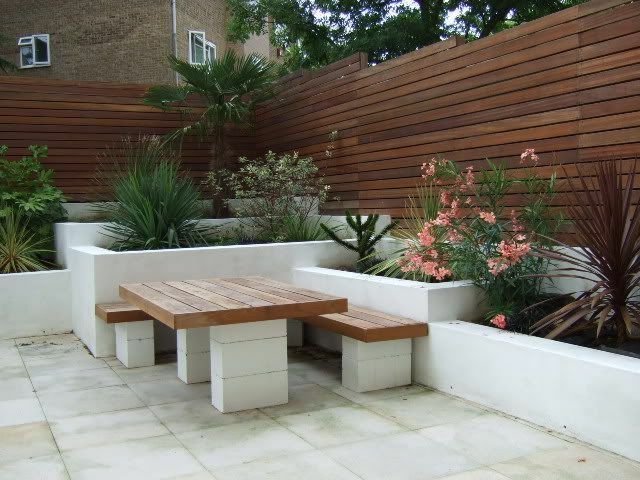 Bulky yet graceful, it offers a substantial space for people to sit and hang out in the garden. In the pictured example, the concrete surface has been softened by the use of seat cushions, adding a personal touch as well as making seem a little more inviting. While this design looks chic and modern, it’s not one for a smaller garden. The bench’s thickness adds durability, meaning that it’s likely to last a lifetime and all different kinds of weather. But it also requires a lot more concrete than a smaller design. Its smoothness and simplicity do, however, mean that it’s easy to clean and maintain, much more so than a rusting metal design. This beautiful outdoor bench by Great Deal Furniture is known as the Refuggio Lightweight Concrete Bench. It is available on Amazon, and is really stunning! The lightweight top is made of glassfibre reinforced concrete, and the X-shaped base is made of metal. The blend of metal and concrete is quite striking, and is really rather warm in tone, perhaps due to the high-quality finish on the concrete and the metal. This bench design takes innovative concrete designs to the next level. The astounding ‘O’ shape seems to defy gravity in a loop-the-loop that is set apart from the rest of the concrete wall. By adding the wood panels at the top and bottom of the design, it adds a little warmth to the structure and also makes it much easier to fit in the overhead lights pictured. In this example, the concrete and wood design has been softened by its decoration to make it into a super cozy hideout. Adding a lick of paint to the inside of the concrete walls helps to make it feel a little warmer and more inviting, with some plump colored cushions to match. This is also the perfect design for those who are looking to spend more time in the garden but live in wetter climates. The arch of the ‘O’ creates a custom shelter from the rain, meaning that you can stay in your outdoor hideaway even when the weather takes a turn for the worst. 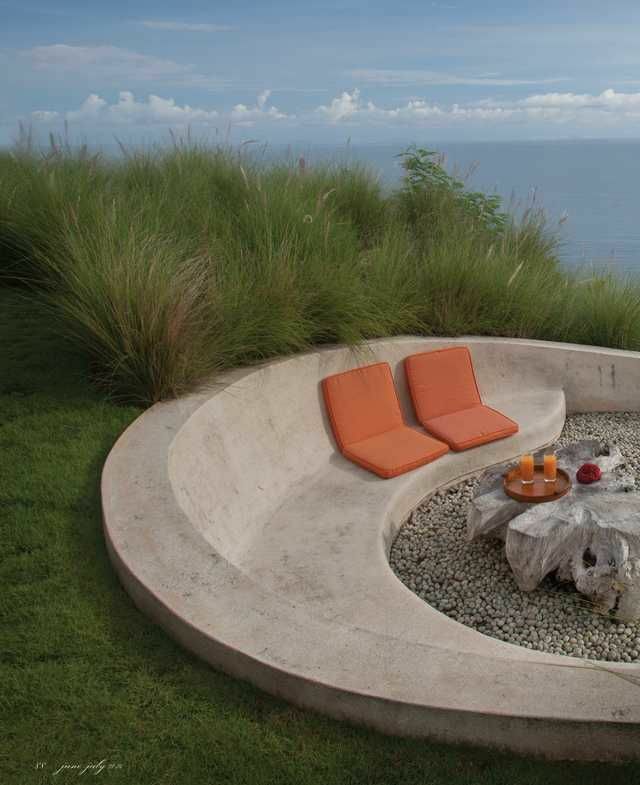 We also love the echo in the circular concrete fire pit (is it an ethanol fireplace insert with rocks around it?) melded with a circular water feature. One thing we will say is that these recliners are a little hefty. Having two side-by-side like this in the garden will take up a significant amount of space, but if you’ve got room to spare in your backyard then these are ones for you. Alternatively, if you’re looking to use a minimal amount of outdoor space, only installing one or arranging them in a back-to-back formation could save room, and also look sleek and symmetrical. Ideal for summer climes, this is a design made for people who want to maximize their time sitting under the sky. How cute is this little stone and concrete bench? Shrouded in moss and lush leaves, this bench looks like something out of a fairytale! By allowing the moss and other plants to grow over the bench, it gives the concrete and stone bench a much more natural feel, keeping it at one with nature and the greenery of the garden. It’s also not too big, meaning that it won’t take up too much space in a smaller garden, and looks best when it’s set beside an overgrown flower bed. The shape of the bench itself will fit right into any garden, adding a classic, classy tone to the backyard. This style of bench is found in both parks and palaces, gardens and grounds. It never goes out of style and is totally timeless. The aged look in the pictured example adds to its romantic feel, seeming as though it’s stood for decades, soaking up the history around it. This garden bench is echoed quite nicely in this EMSCO Garden Bench available on Amazon, though it is made of lightweight resin as opposed to concrete and stone. Yes, the top slab on this bench is actually made of concrete, not wood! Another beautiful concrete and metal bench by Great Deal Furniture, the Andre Textured Light Weight Concrete Bench is a real stunner. Available in two finishes (gray oak and brown oak) the Andre Textured concrete bench is really a remarkable piece of concrete patio furniture that ventures very far from the brutalist, industrial feel that is so common among concrete furniture and structures. If the primary function of your patio furniture is to dine, then it’ll probably be a set of table and chairs that you’re after. The following ideas will suit people who are looking for an outdoor spot to work, draw or read with a stylish surface in front of them. They’ll also fit in well with a garden that’s used for alfresco meals, from meaty barbecues to summer salads. Sometimes two materials can be better than one, and this is definitely the case with concrete. Wood is a classic material to use in table design, but if you’re looking for a sturdier base, then concrete is the way to go. This table and bench combo uses painted concrete blocks as legs for the furniture, but tops it off with a smooth wooden surface. The element that works best for this design is its chunkiness. Concrete, by nature, is neither delicate nor slight, meaning that bulky blocks are the way to go when incorporating it into a design. A thinner wooden tabletop wouldn’t work as well when paired with the sizable concrete table legs, so by keeping things thick from top to bottom, this design really works. In the example shown, the painted concrete mirrors the white wall behind it, while the wood echoes the mahogany tones of the fence define the perimeter. By coordinating the colors and materials in your garden, it can work to create an overall aesthetic harmony. Used correctly, modern concrete table designs can add a stylish twist to the patio. The inverse of the previous idea is this: wooden table and chair legs crowned with concrete seats and surfaces. This design mixes the natural with the artificial in the same seamless way as its inverse, but with thinner table legs and a hefty surface. Concrete is easy to wipe down and keep clean and will also last a lot longer than other materials, making it the ideal candidate for an alfresco tabletop. In our opinion, a concrete surface is better suited to a greener garden, as a small stoney space may feel too harsh or industrial without enough nature on display. This example uses a dug-out channel spanning the length of the table and filled with a mini flower garden to soften the stark concrete surface. Their color also works to lighten up the ensemble, as concrete and wood can both get quite dark in shade, especially after rainfall. Here we have yet another beautiful outdoor concrete patio furniture piece by Great Deal Furniture, available on Amazon. It’s the Doris Concrete Patio Table, and it features a beautiful concrete top finished in a design that echoes a granite counter top. Available in a gray and brown finish, these tables are once again made of high-quality lightweight concrete and are surprisingly easy to move around. They’re also super robust, and can handle virtually any environment! The Doris table is a good size table for six people and will look great in virtually any decor environment. This design, unlike the other table designs, is made entirely of concrete, which optimizes its durability. While having an entirely concrete table may feel like you’re running the risk of a dull or drab design, this piece has been jazzed up with some gorgeous ingrained rocks into its surface. This works to add a little extra texture to the design, giving it a subtle twist using natural materials. This also helps to make it feel a little less industrial or brutalist and moves the furniture piece in a beach-y direction with the gentle sprinkling of rocks. The blockish feel of this furniture looks fun and futuristic. Like the first table and chair example, the tabletop is supported by two large blocks which keep things sturdy and simple. The accompanying benches are equally blockish and help to round off the set nicely. The dark finish on the furniture makes the ensemble feel more like granite than concrete, stopping the design from looking cheap and adding a dimension of class. 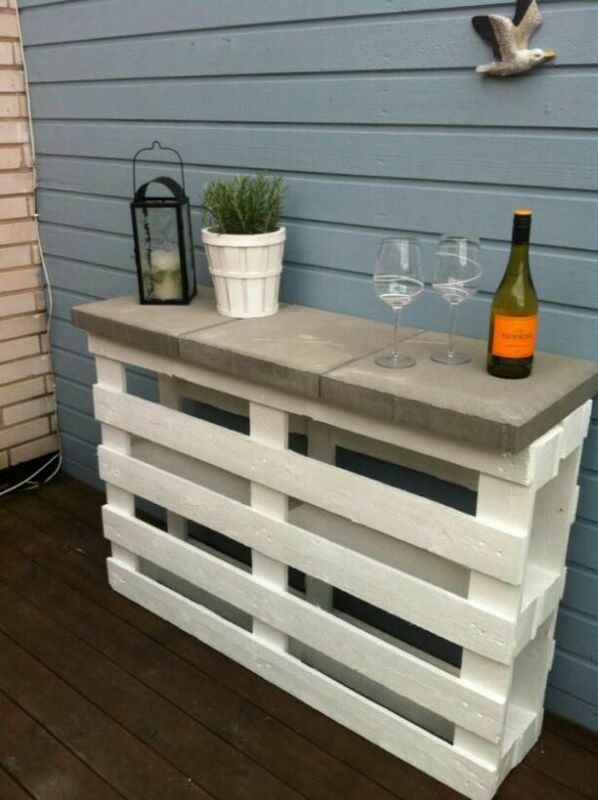 The design shown here creatively uses pallets found on the street to create a tidy little tabletop for the garden. This is the epitome of up-cycling, using materials that would otherwise be thrown out to create something new and unique. By using concrete blocks as the surface of the table, the up-cycled vibes are enhanced, making the ensemble seem rustic and artfully thrown together. Not to mention, it keeps things cheap and cheerful! By painting the pallets a neutral color like white, any wear and tear are hidden, and they will complement the brutalist concrete much better. The clean concrete and fresh white paint disguise the fact that you built the tabletop yourself, making it seem clean and brand new. The height of this design is ideal for gardens that are short on space, but still need a table or countertop furniture. The narrow width makes it perfect for slotting into place on a patio or decking. As pictured, this design is great for holding potted plants, candles or – perhaps most importantly – a bottle of wine or two. We hope that you’ve got a whole lot of inspiration from these designs. 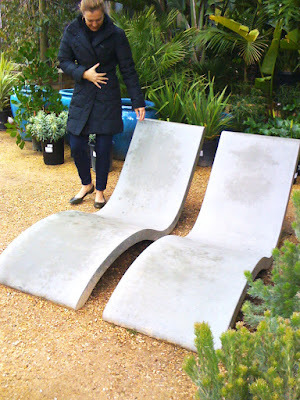 Concrete is a very intriguing material for outdoor furniture, whether it be dining tables, benches, or planters. It can be brutalist and strikingly modern, or it can go warm and inviting. These projects can be fun and not terribly expensive if you’re willing to DIY them. Just be careful to get them right the first time, as you don’t want to have to throw out a failed concrete patio furniture set!